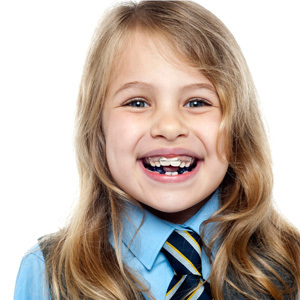 Children and teenagers are ideal candidates for orthodontic treatment. Because the jawbones are soft and still growing, a young patient’s smile is particularly receptive to re-alignment. In addition to enhanced aesthetics, a straighter smile also offers significant health benefits including improved speech and better access for oral hygiene. The American Association of Orthodontists recommends a visit to the orthodontist at age 7 (or earlier if oral or facial irregularities are present). Early intervention allows us to guide the growth of the jawbones, helping the permanent teeth come in straight. We do this by creating more space where teeth are crowded and regulating the width of the upper and lower jaws. This helps to avoid impacted teeth and other costly and painful complications later on in life. To determine if your child will benefit from braces, we will perform several painless diagnostic procedures. This initial phase may include panoramic X-rays, bite impressions, and computer-generated images of the head, neck and jaws. These steps also help us to decide on the best treatment option for your child.